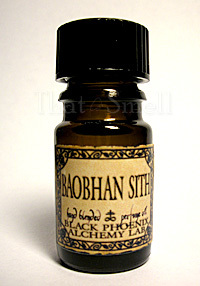 Baobhan Sith is one of Black Phoenix Alchemy Lab‘s more veteran general catalog scents. Discontinued in 2005, it came roaring back the next year with its tart, grassy citrus and tea scent. This is a well-loved BPAL with excellent longevity and a great fresh, clean personality. In Bottle: Tartness with the mild sting from citrus. I get the slightly astringent white tea as well. Baobhan Sith is a very white, very clean and fresh fragrance. Reminiscent of grassy knolls and ethereal mists. This is a fragrance that makes me think of teatime and, for some reason, cranberries. Applied: Initial flair of citrus, a very normal thing for me as it seems, before the grapefruit says it’s had enough of me and decides to recede into the background. The white tea is the real star in this fragrance as it dominates for the better part of the scent’s wearable lifetime. There is a very, very mild bite of ginger in this as the fragrance ages, the white tea mellows out and the ginger gets its time in the sun. Fresh, citrus, clean with a really (I mean it) light touch of ginger to round it all out. Extra: Baobhan Sith (pronounced, “Bow-Vahn Shee”), heralds from Scottish mythology where beautiful women in green dresses wander the mists as bloodsucking vampires. Design: Similar in design to many other general catalog scents from Black Phoenix Alchemy Lab. The oils are stored in an amber bottle with a twist black cap. The label is printed with the house name and fragrance name. Notes: Grapefruit, white tea, apple blossom, ginger. Baobhan Sith is great as a wearable fragrance but also a good room scent if you feel like diluting it a bit in water and letting an oil diffuser do its work. BPAL fragrances are perfume oils, meaning they are not set in an alcohol base and are therefore unsuitable to be sprayed. Should one attempt to spray perfume oils, they will be met with a drooling, uncooperative stream, and a broken sprayer nozzle. To use BPALs as a spray perfume, you’ll have to find an alcohol base to dilute the perfume in first. You can find perfumer’s alcohol in specialty stores online. Reviewed in This Post: Baobhan Sith, 2009, 5ml Bottle. This entry was posted in black phoenix, citrus, fresh, Reviews By House and tagged alchemy lab, apple blossom, black phoenix, bpal, citrus notes, ginger, grapefruit, white tea. Bookmark the permalink.